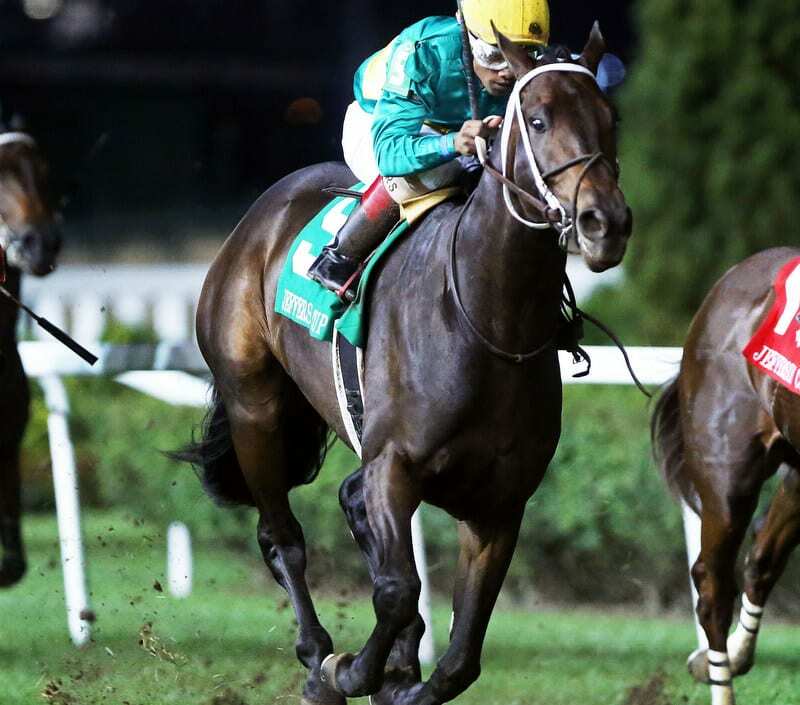 Woodford Racing's Jefferson Cup winner Hot Springs tops a competitive field of seven 3-year-olds that were entered for Saturday's 15th running of the $100,000 Commonwealth Turf (Grade III) at Churchill Downs. The Commonwealth, run at 1 1/16 on the Matt Winn Turf Course, is carded as Race 9 with a post time of 5:06 p.m. (all times Eastern). First post on Saturday is 1 p.m. Hot Springs, a Kentucky-bred son of Uncle Mo, is perfect on the Matt Winn Turf Course with three victories to his résumé, which includes a 4 ¼-length maiden-breaking score on June 9 and a 1 ½-length allowance win on June 29 prior to his one-length win in the $100,000 Jefferson Cup on Sept. 29. Hall of Fame trainer Steve Asmussen's go-to rider Ricardo Santana Jr. has the mount on Hot Springs and will break from post position No. 7. Among Hot Spring's main Commonwealth Turf competitors is Ken and Sarah Ramsey's Mystic Lake Derby winner Sniper Kitten for trainer Mike Maker. The son of Ramsey's prized stallion Kitten's Joy has three wins through six lifetime starts including his lone stakes victory in the one-mile Mystic Lake Derby at Canterbury on June 29. Jockey Tyler Gaffalione has the mount on Sniper Kitten and drew post 3. Also entered in the Commonwealth Turf is Live Oak Plantation's ultra-consistent March to the Arch for trainer Mark Casseand jockey Julien Leparoux. March to the Arch, who sports a record of 9-3-2-1—$196,374, won Woodbine's Toronto Cup by 1 ¾ lengths in July. The gelded-son of Arch was most recently fourth in the Hill Prince (GII) at Belmont on Oct. 6. March to the Arch drew post 4. Reride (Florent Geroux, Asmussen); Marzo(Albin Jiminez, Ben Colebrook); Sniper Kitten (Gaffalione, Maker); March to the Arch (Leparoux, Casse); Year of the Kitten (CoreyLanerie, Maker); Zero Gravity (Adam Beschizza, Joe Sharp); and Hot Springs (Santana, Asmussen). This entry was posted in Racing and tagged churchill downs, Commonwealth Turf, Hot Springs, Ricardo Santana Jr., steve asmussen by Press Release. Bookmark the permalink.